I started writing down thoughts when I was halfway through the book. There were a lot of details; and then the new plot-arc that had my mind reeling. I wanted to be able to have my thoughts down while I could still remember them. And I wanted to be able to word them properly since my feelings about Daughter of Smoke and Bone was all I really had. But after a few sentences, an entire review manifested almost immediately. So for now, excuse the rambling that ensues starting from here on out. Once again, I’m conflicted about this book. On the one hand, it’s written very well with great prose and style, excellent dialogue, and an undertone of dry humor that I love. The ideas are creative, the world is unique; there’s an almost mythical legendary feel to the storytelling. And I really, really like it. Karou makes for an awesome, kickass, strong heroine amidst a dangerous world hidden in modern society. A paranormal or fantastical world hidden within the modern world with our heroine harboring a big secret and living a double life--this is the type of world creation I adore. The rest of the world is created in such detail that I can actually see a different adventure unfolding with different main characters if given the chance. The progression of the story is very smooth and paced in a way that I can accept without fault. In fact, I really DO love the way that the entire book was written, the way the characters were introduced, the subtle humor and witty dialogue... I even enjoy the underlying main conflict of the war between seraphs and chimaera--it’s pretty epic, actually. In all honesty, I enjoyed all of that. 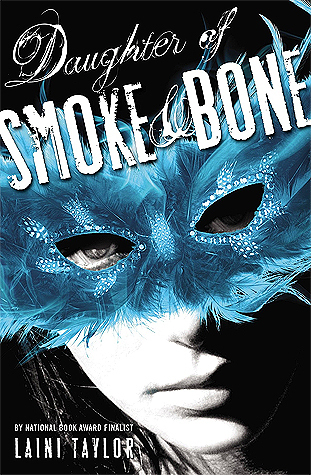 But then there’s that SOMETHING that I barely put my finger on that makes Daughter of Smoke and Bone not work for me. I don’t know if it has to do with the Angel and Demon motifs or maybe it’s the “Fated to Be” true love device. Was it the over-emphasis of a lot of things that we, as the readers, already knew to be true? Was it even the slight tangent into the past that I didn’t really care to read about over four (?) chapters that could have just as easily been a short two chapter flashback? I’ve never been one to dismiss paranormal just because of a particular theme I don’t care for (vampires, werewolves, demons... the like). And I DO like slight detours into the history of our characters if it means I understand their lives a little better. So maybe it’s the whole “Fated to Be” true love device that’s getting to me. Oh yes, and also the continued, pounding into our heads of certain facts: Akiva and Karou are beautiful beings, Akiva and Karou were meant to be lovers, Akiva and Karou are mortal enemies, Akiva and Karou are meant for no other. Is it too harsh of me to say, in a very exasperated tone that: Yea, I get it already, so stop mentioning it every other chapter. As for the grand romance: I get the scenario and it’s written beautifully; however, I just can’t seem to get behind the idea. And maybe this is just a case of “It’s not you, it’s me” when it comes to this book. Because the story itself isn’t bad, the writing is excellent, and I love the characters from Karou, to Brimstone, to Zuzana. They’re great. I’m even not too repulsed by Akiva despite the many, many, many, many references to his beauty, which... I get it, he’s an angel and he’s molded as perfection and he’s beautiful. And Karou is beautiful and, in spite of all of her scars, she is also akin to perfection. There’s no need to pound that into my brain; once or twice is enough, and thank GOD Akiva doesn’t sparkle. Or does he? In his own angelic way? Or something like that, right? Oh look, I found something to dislike about this book! All of the conflicting emotions coming in a “‘Fated to Be’ so I can’t kill you and am instead just going to stalk you” scenario bugs me. That is definitely why I don’t like Akiva. It is also why I didn't like the romance. Okay, maybe I was a little repulsed by Akiva. Maybe a little. On top of that, I started losing track of how many times Karou and Akiva spend time questioning why they're drawn to each other like some supernatural force--it's pretty much YA speak for, "the author wants readers to know that the two are supposed to be a couple, for no other reason than 'just because that's how it was planned in the outline.'" I mean, it could be that they're just physically attracted to each other as typically happens in real life, but due to reasons (chimaera vs. seraphs, yo) they can't be together. But like most confused teenagers, they can't figure out their feelings and have already decided that love is in the air, and so cue the angst. The insta-lust attraction is the most obvious explanation since I had yet to see either of the two bond over anything other than a compulsory physical attraction. A fact that, much like Karou and Akiva being perfection embodied, is repeated over and over again, like I didn't already figure it out. Story-wise, I pretty much had the "BIG SECRET" about Karou figured out way earlier in the game than Akiva did. The scenario and direction of this particular telling was just plain obvious... which then falls back into why the two were so drawn to each other... which really didn't make the big romance any better, to be honest. I would have rather preferred the insta-lust scenario more, because at least there's potential for attraction to become love if the two were ever given book time enough to bond rather than angst about how pretty each other is. Because, when and where do we cross the wrong lines in a lifetime where a grand love is anchored on this type of basis? I'm still conflicted about it, and I definitely don't like it. It probably works for a lot of other people, such a grand scale romance based on Fate or the like. But I just don't see it. Fortunately, the book itself is written well and the heroine is pretty badass. And I loved Zuzana because she’s wicked funny and a little crazy (but in a good way). The chimaera are interesting creatures and I can’t wait to see more of them. The lore and the world created in Daughter of Smoke and Bone is nothing short of excellent; I can’t stop loving every time I come across a book that has such a complete world that I can, as I mentioned above, imagine other characters taking on an adventure all their own. To the point (and I reinforce that I am a HUGE hopeless romantic), I found myself enjoying parts of the book that had nothing to do with the grand romance. In fact, I absolutely loved the first half of this book up until the point where Akiva officially comes into the picture and meets Karou, face-to-face. It’s a good read and I enjoyed it. I had let it sit for a while to let the feeling of obligatory reading fade, but I was almost reluctant to pick it up again. But when I DID pick it up again, at least the writing kept me grounded enough to finish the book. There's still that sense of "need" that I had to move on from one chapter to the next because the story was unfolding some sense of excitement in me. But there was also that need to just finish the darn book and be over it. As you can tell, I was and am still extremely conflicted about this book. I mean, I really DID enjoy it and have an itching to pick out the next book. But I’m not sure if I’ll be in much of an awful hurry to read the rest of the series or not. If that even makes any sense... It’s written extremely well, and that, at least has me hopeful that maybe I’ll enjoy the rest of it now that the initial “Meet Cute” of our lovers is out of the way. Had it been a different kind of story with a different type of emphasis (not the “eternal fated romance between unearthly beautiful beings” persuasion), I might have enjoyed it a whole lot more. For all it’s worth (at the risk of being repetitive... like this book’s romance), I really DID like the book a lot up until the fated official meeting where Akiva and Karou choose to defy all instinctual “you’re my enemy” logic and hang together, while at the same time keeping their “you’re my enemy” logic hanging like a giant elephant in the room as a verbal barrier... and then they make eyes at each other and flirt like lovers. But who am I to judge two people in love, right? The concept takes all forms even IF it escalates rather quickly from physical attraction. For what it’s worth, I totally loved all the side characters from Zuzana to Brimstone... and maybe even Kaz for his predictable comic of assholery.